(Nanowerk Spotlight) One of the (many) major challenges in getting closer to realizing visions of skillful nanomachines and ubiquitous nanofactories is the construction of synthetic nanomotors and other nanoscale propulsion systems that power these devices. At issue is not only the small scale of these systems but also the ability to precisely control their motion. Complicating the issue is that navigation principles used in the macroscale world are not applicable for nanoscale propulsion. The precise navigation of nanoscale objects is extremely challenging because of the combination of Brownian motion (random movement of particles) and low Reynolds number (where viscous forces dominate). Researchers in Germany have now demonstrated artificial water-walking devices in the form of self-powered microstriders at the air-liquid interface made of rolled-up catalytic microtubes. "Motions in fluids at the micro- and nanoscale have generated numerous ideas and concepts to overcome the high viscosity problem at low Reynolds numbers" Alexander A. Solovev, a PhD student at the Leibniz Institute for Solid State and Materials Research (IFW) Dresden, tells Nanowerk. "So far, though, there have been few demonstrations of micro-/nanoscale water-walking devices. Our findings help to study new dynamic self-assembly systems where microstriders can self-assemble in a reversible manner." Solovev is a member of the Institute for Integrative Nanosciences at IFW Dresden, led by Oliver G. Schmidt, and first author of a recent paper in Advanced Materials where he, Schmidt, and Yongfeng Mei, now a professor at Fudan University in PR China, show that inanimate catalytic Ti/Cr/Pt microtubes with diameter 5-10 µm and length of ∼ 50µm can act as a water strider at the air-liquid interface of hydrogen peroxide aqueous solution ("Catalytic Microstrider at the Air–Liquid Interface"). "Climbing onto objects at the liquid-air interface can be a tricky or even impossible task for other artificial micro- or nanomachines" explains Solovev. "An important feature in our work is the very low weight of our microstriders which are constructed of rolled up tubular nanomembranes. When oxygen gas fills microstriders it lifts them up directly to the air-liquid interface. Interestingly, immersed microcapillary allows in some way to perform a 'fishing' of dynamic microstriders." The microstriders are self-powered and buoyed by oxygen bubbles decomposed from hydrogen peroxide within tubular jets driven by a microbubble propulsion mechanism. We have reported about the team's work on these microjets in a previous Nanowerk Spotlight ("Microbots transport, assemble and deliver micro- and nanoscale objects"). These self-propelled catalytic micromachines move at the aqueous surface for minutes until their hydrogen peroxide fuel is consumed. The platinum in the tube casings acts as a catalyst to decompose the hydrogen peroxide into water and oxygen. The oxygen gets collected as bubbles, which are ejected from one of the tube ends and thus recoils, i.e. propels, the microtube. Solovev notes that the filling volume of gas in the tube is around one quarter of the body volume of the catalytic striders, which thus is enough to take the striders to the air-liquid interface. "We found that catalytic microtubes firmly attached to bubbles can attract each other at an aqueous fuel surface and self-assemble into patterns due to the meniscus-climbing effect" he says. "Bubbles pull attached microtubes together and form self-assembled structures of microtubes. By tuning the surface tension of the fuel, the attaching and detaching times of bubbles to and from microtubes can be adjusted for controllable dynamic self-assembly." 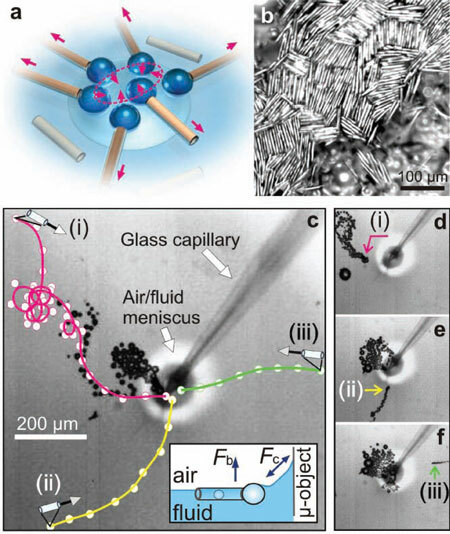 The researchers say that attracting capillary force induced by the meniscus-climbing effect was easily studied by inserting a glass capillary into the surface to anchor their micromachines. After inserting a glass capillary into a fuel surface, several catalytic micromachines that were moving around now rush spontaneously towards the capillary at the liquid surface (see movie below). According to Solovev, catalytic microstriders can be potentially coupled for the detection of chemicals or biomolecule of interest. "For instance, if certain molecules are present in a given solution, it can change the surface tension and microstriders can self-organize into colonies." This work by the IFW team is also helpful for understanding certain aspects of bio-inspired robotics; in particular, if interactions among an ensemble of micro- and nanomachines in fluids needs needs to be considered. Also, the balance between capillary and drag forces that determines assembly and disassembly of the microtubes, is an interesting aspect when studying dynamic self-assembly on the micro- and nanoscale.